What’s Buzzing? If you have watched the popular Korean drama Descendants of the Sun (DOTS), you would have noticed Dal.Komm Coffee in many of the romantic scenes. 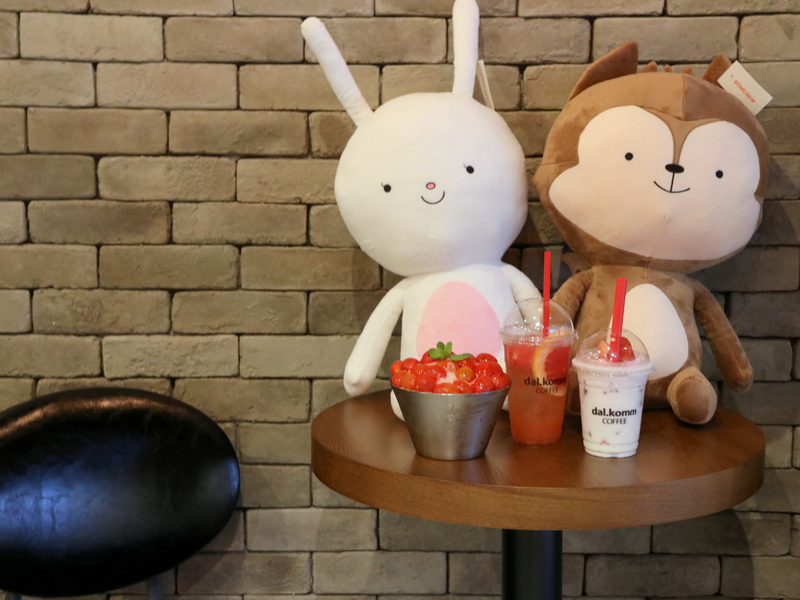 The first dal.komm Coffee finally opens in Singapore at The Centrepoint today, where the brand already has more than 160 outlets across South Korea and Malaysia. The spacious 3000 square feet outlet at The Centrepoint will be its Singapore’s flagship outlet, with ongoing plans to open more outlets here. The Highlights Coffee is the main highlight here, where Dal.Komm Coffee distinguishes itself from other coffee chains by its customisable Arabica bean blends K1 to K3 paired with the Espresso (S$4.50), Capuccino (S$6/cold, S$6.50/hot) and Caffe Latte (S$6/7 for hot, S$6.60/S$7.50 for cold). We tried all three blends and I like the full-bodied flavour of K3, even though all blends have its own unique punch. Alternatively, go for the Cube (S$8.50) which is basically blocks of frozen espresso suspended in milk. It’s probably the only time when your coffee flavour intensifies as the ice melts! The Other Drinks Coffee aside, there are rejuvenating options such as the Honey Grapefruit with half a fresh grapefruit cut and drizzled with honey, as well as the Strawberry Cube (S$8.50). For tea, there is the Mojito Black Vitali-Tea using its own Apple and lemon tea infused with black tea, lemongrass and mint. The Bites For confectionery dishes, the Injeolmi Toast Red Bean (S$8.50) is a toasted sandwich filled with Korean rice cake and red bean paste, coated in soybean powder and honey. The Cruffin Matcha (S$11.50) is topped with matcha curd, whipped cream and honey. I wished that the matcha flavour was more intense and the crust was crispier. What’s a Korean cafe without Bingsu? The Cherry Tomato Bingsu (S$10.90) is meant to lessen the guilt on having this dessert, made with fresh cherry tomatoes and homemade sweetened milk sauce. I personally didn’t taste much of the milk sauce, which I’m not complaining but it will definitely not be sweet enough for some people. Overall Experience We have no lack of coffee chains in Singapore but Dal.Komm Coffee will probably be able to compliment the existing scene with its Korean brand name and strong music-centric theme. Other than coffee and bites, the brand will be hosting music events (not limited to Korean music) in the Centrepoint space to give diners a more wholesome dining and drinking experience. For now, we are excited to see how that unfolds.